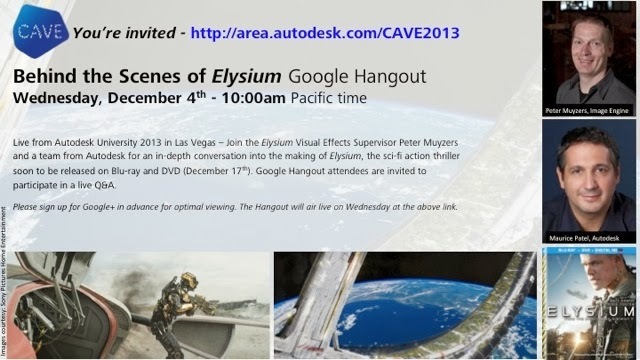 GenreOnline.net: ELYSIUM visual effects supervisor, Peter Muyzer, will be participating in a Google Hangout on Wednesday 12/4 from 10 AM PST – 11AM PST, during which he will discuss the making of the film from a visual effects perspective. ELYSIUM visual effects supervisor, Peter Muyzer, will be participating in a Google Hangout on Wednesday 12/4 from 10 AM PST – 11AM PST, during which he will discuss the making of the film from a visual effects perspective. ELYSIUM visual effects supervisor, Peter Muyzer, will be participating in a Google Hangout on Wednesday 12/4 from 10 AM PST – 11AM PST, during which he will discuss the making of the film from a visual effects perspective. The hangout will be streamed live from the Autodesk University 2013 conference in Las Vegas, “moderated” by Autodesk’s Maurice Patel. Note: Autodesk is the software program used to create some of the visual effects in the film. Conan O'Brian plays GTA - Very Funny! Keep Up The Good Work, But Don't Lose Sight. From My Novel The Final Arbiter. Rest In Peace Syd Field. Alternate Breaking Bad Ending On YouTube. A brief excerpt from my book The Final Arbiter. John Waters Fans Take Note. Boldly Going Forward In January, 2014. Happy Veteran's Day! Thank You! Quick Thoughts On Ender's Game. A short quote from my novel The Final Arbiter. 12 Monkeys TV Pilot Gets Cast On Syfy!